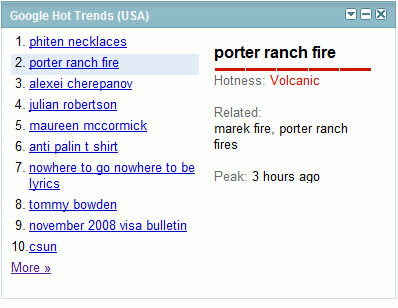 Google Trends shows what people are searching, it is great tool to see what is hot today. It displays 100 hot trends for US, these hot trends are from the last hour and updated every hour. While browsing i just saw there is an RSS feed available for hot trends. The RSS feed shows hourly trends and there is also an iGoogle gadget if you use iGoogle home page. If you want to keep up with what are people are searching today add this rss feed to your feed reader. Although the feed is working it is not formatted well. Hmmm..might be handy if I wrote about celebritys regularly. Nice post. I wish I actually was on my webmastery game enough to take advantage of this.